Today is going to be write-tastic! I get to interview a guy about weaponry and combat tactics this afternoon, and then I’ll have an evening of writing with a friend. I think I’ve decided that I really like interviewing people—learning about their experiences and perspectives can be so eye opening. What about you? Excited about any writerly plans today? How often have you tackled a manuscript draft, only to meet with overwhelming discouragement? No matter how long you spend on that scene, you can’t seem to fix everything. The dialogue won’t pop, and the descriptions still don’t jump off the page. However much you tweak, something always needs fixing. Recently, my perspective on the editing process changed incredibly. The person who changed it is Reyna Grande from a UCLA Writers Faire panel. Consistency. Your main character’s blue shirt can’t inexplicably turn plaid by the end of the scene. And where exactly is 12th street? How did it jump locations so quickly? Personally, I find it horribly easy to mix up these details, so my first editing spree will be to double check for consistency. Character growth. Fine tune your character’s gradual changes. At what point does he or she show maturity? Courage? Loyalty? It shouldn’t just appear with the snap of your fingers. Weave it into the fabric of your story so that the change feels natural and satisfying. Dialogue. If you had a hard time pinning down your characters’ voices on your first draft, listen closely this time around. How do they talk? Any slang or jargon that they should use? Get to know them on a conversational level. Descriptions. Once you have the plot and character essentials taken care of, start delving into the background. The atmospheric sights, smells, and sounds. Give texture to your world. Imagery draws your readers in, giving them more ways to connect emotively with the story. I’m sure that you’ll need more than 4 drafts, but these are enough to get you started. After each draft, you’re closer to your goal of a perfectly sculpted manuscript without adding the stress of scene-by-scene perfectionism. Any other elements that you think deserve a draft of their own? 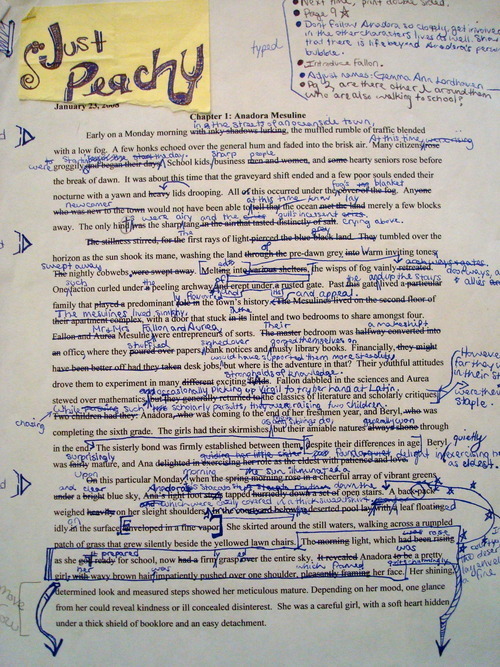 What does your editing process look like? Book publishing is a complex interplay of the creative and economic. At the end of November, I’ll finish the first draft with about 80k! I can’t wait to type ‘finis’ at the end and know that I’ve finally accomplished my goal, because then I get to edit the whole thing over and over again. I don’t know why the thought of so much work makes me happy, but it really does. How’s your writing coming? Any NaNo inspiration getting you pumped for November?